St. Patrick's Day in Savannah -- there's nothing like it. Lot’s of places in the world celebrate St. Patrick’s Day on March 17. In Savannah, Georgia, we celebrate St. Patrick’s Day and Irish culture for more than two weeks. The Savannah Irish Festival, a wondrous event filled with music and dance, took place February 17-19. 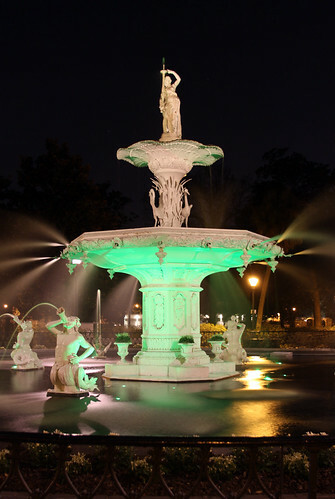 If you missed that, consider coming to town on Friday, March 9, to witness the greening of the fountain in Forsyth Park and an Irish Heritage Dance at Alee Temple. Tara Feis takes place on Saturday, March 10, from 11:00 a.m. to 5:00 p.m. in Emmet Park. There will be lots of Irish dancing, Gaelic music, and activities for children. There’s also a St. Patrick’s Day Parade on Tybee Island the 10th, a Celtic Cross Ceremony the 11th, and what should be an amazing performance by the Carrigbyrne Pike and Choir at the Cathedral of St. John the Baptist on the 15th. All of our Savannah Vacation Homes are full on March 17, 2012, the day of the Savannah St. Patrick’s Day Parade; however, we do have space available during some of the events mentioned above. Come get a taste of St. Patrick’s Day in Savannah this year. Then make your plans for 2013, the 200th anniversary of St. Patrick’s Day in Savannah. Please visit St. Patrick’s Day Savannah for a complete list of events and activities.